Oakton Coins & Collectibles in Evanston-Skokie – Sell coins, gold, silver, & jewelry around Evanston. Oakton Coins & Collectibles buys all forms of gold from Evanston. Oakton Coins & Collectibles buys US & Foreign Coins + Paper Money. 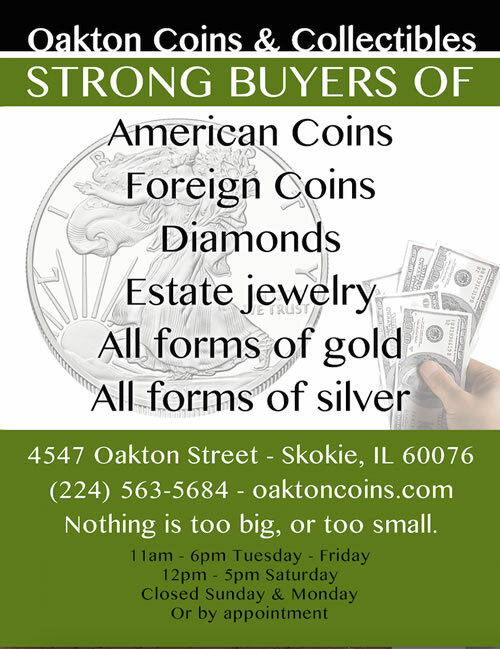 Oakton Coins & Collectibles in Evanston-Skokie : We buy & sell coins, paper money, all forms of gold & silver, estate jewelry, platinum, stamps, diamonds, and more…..
Are you in search of a reliable and honest dealer to whom you can sell your valuable coins at a worthy price? Unless you take it to the real coin dealer, you may not realize the true value of your coin collection which has been sitting in your drawer for years, untouched. Therefore, the solution is to find the best dealer in town and settle a fair and beneficial transaction. If you are in a bind and are confused about what to do with old and unwanted coins, then take them to coin shop Evanston (OC&C). Coin Shop Evanston (OC&C) is a reputable company that buys coins from interested sellers and pays a price that is totally worth it. Whether you have gold coins, silver coins, platinum coins, palladium coins, early US gold coins, cents, type coins, dimes, half dollars, dollars, or miscellaneous items, you can sell them all at Coin Shop Evanston (OC&C). If you are wondering whether you can sell your foreign money or not, then you certainly can. Bid adieu to the unwanted metal pieces and embrace the highest amount of cash in exchange. •While selling coins, you should do a bit of research to find the best dealer. Not everyone works with honesty and only a few places offer a value more than 50% of its true value. Get to know the latest market rates and be aware of the current trends. You can also check out the auctions. However, selling your valuable items to a reliable company is the best and the safest option. •The trained and highly skilled staff at Coin Shop Evanston (OC&C) offers only the highest and the most fitting price for your coins. Depending on its age, quality and type, the experts judge the value of coins. It may take some time to inspect the coins or the items, but you will surely be benefited from it since Coin Shop Evanston (OC&C) believes in fairness and mutual benefit of the company and the customer. Do not worry about the shape or size of the coin. Oakton Coins & Collectible (OC&C) in Skokie – Evanston will certainly buy it from you at the best offer. •Being in this business for a long time, Coin Shop Evanston (OC&C) has learnt about coins and understood them and that is the reason why your money is valued. To pay the full price of what the coins are worth is the motto of the company. The experts will guide you through the entire process. So, if you have a pile of old coins, you must bring it to Coin Shop Evanston (OC&C) immediately. There is no knowing to how much you will be paid for it. Also, you can sell your paper money too. Now that you are familiar with Coin Shop Evanston (OC&C), you can recommend this place to your family and friends. For a safe, reliable and mutually beneficial transaction, bring all your valuables to the shop and your needs will be fulfilled.